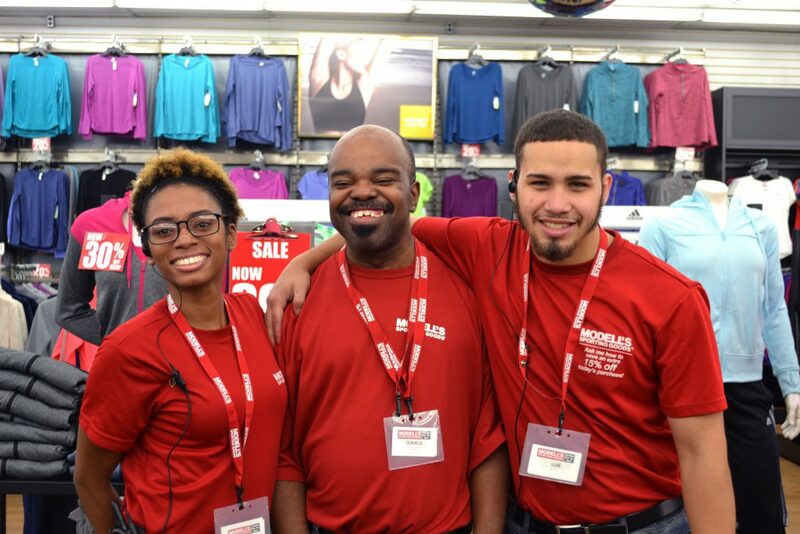 In partnership with HeartShare’s Employment Program, Modell’s Manager Walter Toledo has offered people with disabilities, like Donald (center), the opportunity to work. You’ve been very supportive of HeartShare’s Employment Programs, which offer people with intellectual and developmental disabilities (I/DD) a fair chance to work. How did this all start? Walter Toledo: Well, at the time, I was the Manager at the Modell’s Store on Fulton Street. That’s where I first met Josh [Skolnick, Assistant Director for Transition and Employment Services], and Roni [Soriano, Community Resource Specialist]. WT: Josh and Roni brought in two or three of the individuals. I interviewed everyone to see who was ready for placement. Josh and Roni told me that the individuals would keep the store clean and organized. So, you’re the person who hired Donald, right? WT: Yes, and I’m so glad that I did! He has such an infectious smile. Donald really is the perfect person to be meeting and greeting people when they first walk into Modell’s. He’s able to say ‘hi’ to the customers and offer them directions. Donald’s presence at the door also has deterred theft. Because he’s there shoplifters are forced to go elsewhere. I hired Donald, but the reality is that he’s made a difference at the store. It’s a win-win. That’s great! How was Donald when he first started the job? WT: Donald was immediately friendly and got along with all the store associates. He did open up more over time. Donald was familiar with the store and we were familiar with him. Before he was hired, he would come by with HeartShare’s Brooklyn Day Hab Program to clean our store windows. Was this the first time you hired someone with I/DD? WT: Not at all. About 10 years ago, I hired someone in maintenance at that Modell’s store and he’s still there today. It’s a huge two-level store that needs a lot of upkeep. Whenever issues arose, I took time to work with him and kept the conversation going. What would you tell other employers who are leery about hiring someone with a disability? WT: Well, if you really are an equal opportunity employer, you’re going to take the time to talk through any issues and be flexible. I think employers’ greatest fear in the retail setting is having an employee who is rude to customers. I’ve really never had that issue. People hired through HeartShare are paired with a job coach, who shadows them in their position. As the person cleans or directs traffic, the job coach is there until he’s able to complete the job on his own. Describe a situation when you had to talk something through with Donald. WT: There was a customer who was very rude to Donald. When Donald offered him the promotional flyer at the door, the customer made an effort to ignore Donald. We talked about it and now, Donald knows how to handle that. But you know, that situation isn’t unique to people with disabilities. I don’t like encountering a rude customer either. Open communication and patience is key. That’s it. WT: I’ve been working within the Modell’s family for 15 years now. I started at Modell’s part-time because I love sports. After three months on the job, I was finding ways to improve the store. I became a Manager and had my own store. I did this while I was in earning my Associate’s and then Bachelor’s Degrees in Criminal Justice. I was a court advocate for the Department of Juvenile Justice, which helped children and teens ages 7 to 15 stay out of the system. Rather than sending youth to juvenile detention, I would communicate with their teachers and make home visits to keep the kids on track. About 89 percent of the time, this strategy is very successful. Prior to that, I served in the Marine Corps for about 10 years. That’s incredible! Did you know we have children and family services too? HeartShare St. Vincent’s Services helps children and families affected by foster care, among other programs. WT: Wow, I didn’t know that. Well, in the end, it’s all about helping people! Yes, indeed! Is there anything else you’d like to add? HeartShare’s Employment Program is a great one. All people with disabilities want is respect. Thank you, Walter Toledo, Manager of Modell’s Sporting Goods (Church and Flatbush) for giving a chance to people with I/DD and bringing their dream job within reach. View Donald’s full story here. To learn more about how to become a HeartShare employment partner, please contact Joshua.Skolnick@heartshare.org.